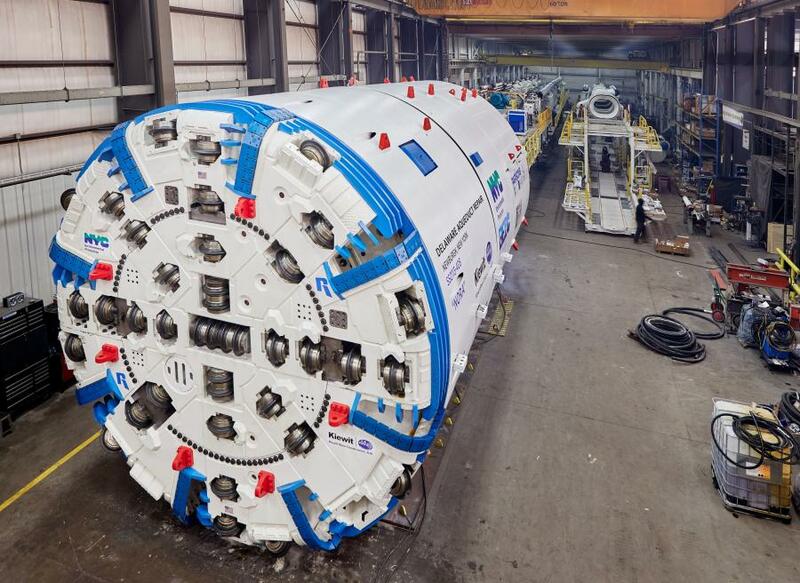 Historically, tunnel boring machines (TBMs) are named for women, a tradition originating with miners praying to their patron saint, Barbara, for protection from cave-ins, suffocation and other dangers associated with digging underground. Naming a boring machine in advance of a project is thought to bring good luck, and thus we have Seattle's Bertha, the Chesapeake Bay's Chessie and New York's Nora, created by the Robbins Company for work on the Delaware Aqueduct. Nora's namesake was Nora Stanton Blatch Deforest Barney, the first female civil engineer in America. On Aug. 29, 2018, a 30.4-ft. (9.26 m) diameter Robbins Crossover (XRE) TBM crossed the finish line at the Akron Ohio Canal Interceptor Tunnel. Naming conventions aren't all that's fascinating about boring machines. Because creating a tunnel is a massive undertaking, the machines are always built to suit, or specialized, based on the ground and soil types they're set to plunder. Project owners are responsible for the accuracy of the ground in question's assessment, called a Geological Bassline Report, or GBR. GBRs are legal documents, from which the contractors and equipment manufacturers take the specs to bid the job and determine the type of machinery needed. Additionally, she said, "Each individual tunnel route has special geological and hydrogeological conditions, which will help design the TBM equipment for a safe and proper use." 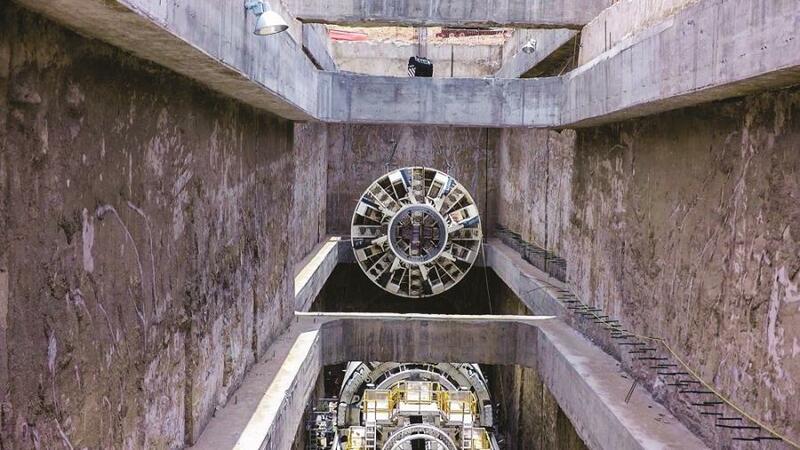 At Mexico City's Túnel Emisor Poniente II (TEP II), a Robbins Crossover (XRE) TBM has excavated at record-breaking speeds through varying geology — even breaking a national record of 62.33 ft. (57 m) in a single day. Once the project owner creates a GBR, other tools may be applied by the tunneling team to warn of potential challenges and to assist in determining the appropriate TBM. In hard rock, such challenges may include unexpected water- and air-filled cavities, or sudden changes indicating weakness zones that could cause danger. Therefore, advance detection by means of a Seismic Prediction System (ISP) is often employed, wherein a surface wave is sent along the tunnel wall, ultimately merging into a space wave at the wall face. Once it encounters a potential obstacle, the reflected space wave generates a response indicating an unexpected condition. In loose rock, Sonic Softground Probing (SSP) systems are employed to ferret out possible obstacles such as boulders, old sheet piles or shafts. In an SSP system, transmitters and receivers operate within the cutting wheel on the TBM. Once the TBM is set in motion, signals capable of reading obstacles up to 44 yds. (40 m) ahead become easily detectable. The application of either ISP or SSP tools work in conjunction with the drilling process and do not affect forward tunneling. The soil types established by a GBR respond to different boring machine faces or shields, into which cutting or pressurized mechanisms are built. The Herrenknecht team notes that there are three different types of shield: open-face shields; earth pressure balance shields; and slurry shields. Each is best applied to specific ground conditions. First is soft ground, which contains a mixture of minerals and/or fractions of rock and/or organic materials without mineral cohesion. Generally unstable, cohesive loose soils have high silt or clay contents and a pulpy consistency. On this type of ground, the most effective boring method is an earth pressure balanced (EPB) shield. Through the application of water or foam, EPBs turn the face to be excavated into a pliable soil paste. The resulting paste creates balance, avoiding an uncontrolled rush of soil into the machine. Quick penetration of the soil with minimum settlement is the desired effect. This 22.3 ft. (6.8 m) single shield TBM will bore a tunnel to replace a damaged portion of the Delaware Aqueduct that supplies half the raw water supply to New York City. Heterogeneous ground requires different treatment. Because of its alternating layers of loose soils and solid rock, or alternate and interlocking layers of cohesive and incohesive loose soils coupled with boulders (most commonly found in underwater locations), slurry supported tunneling methods are best. High-water permeability and instability respond best to a liquid medium or suspension or "slurry," operating under a controlled pressure. Slurry machines are known as AVNs (an AVN is a microtunnelling machine type that bypasses digging when installing an underground pipe) or Mixshields. Generally, these types come with a cone-crushing shield for safety when working within pipe diameters of .43 yds. to 4.4 yds. (0.4 m to 4 m). AVN machines belong to the category of closed, full-face excavation machines. The excavated soil is removed using a cutter head adapted to the particular geology in which it's set to operate. These machines are functional in almost every geological condition. Lastly, there is hard rock, which, according to Herrenknecht, is a mixture of minerals and/or fractions of rock with mineral cohesion. "Rock" is a largely generic description, and includes a wide variety of types such as soft formations to gneiss or granite, with hardness ratings up to 400 MPa (megapascal, a unit of pressure). 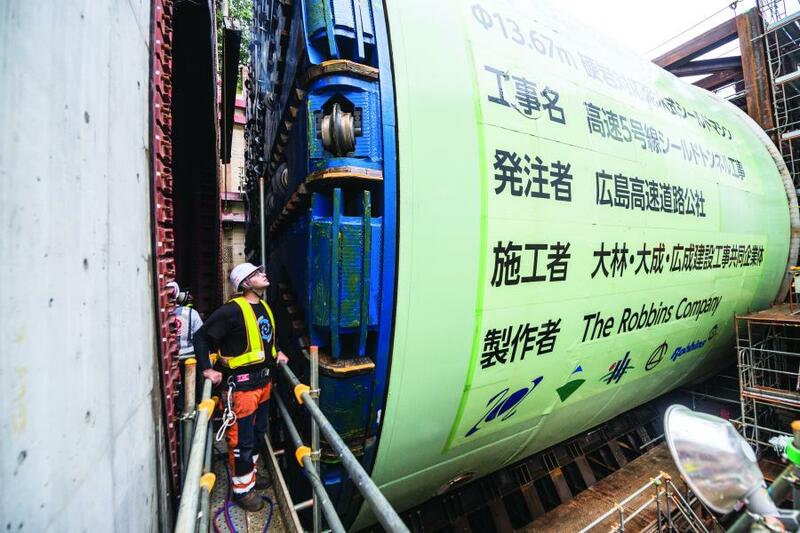 A Robbins mega-sized slurry machine, measuring 44.8-ft. (13.7 m) in diameter, launched at an urban job site for the Hiroshima Expressway Line 5 project. The new Expressway Line 5 tunnel will directly connect Hiroshima's urban area with a major national highway network and is expected to improve access to Hiroshima Airport. Of course, hard rock TBMs are applicable. The ideal choice is a single shield TBM, which functions well when tunneling through rock and other stable, non-groundwater-bearing soils. Single shield TBMs feature a rotating cutter head equipped with disc cutters able to penetrate 32 tons (29 t) per disc. The rolling movement of the discs allows for breaking chips from rock, while buckets near the cutter heads catch the fallout. Also useful for rock face tunneling is the gripper TBM. Gripper TBMs feature a rotating cutter head equipped with disc cutters, which operate at 32 tons of pressure per disc. Grippers are braced against the previously excavated tunnel using laterally extendible hydraulic cylinders. As a result, a Gripper can only be used in stable ground. As with the single shield TBM, the resulting offal is caught by buckets installed at the head of the cutter head. 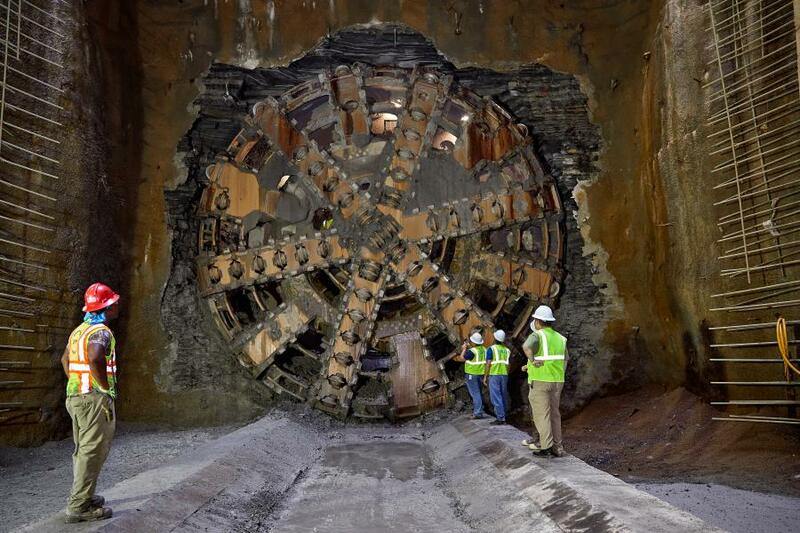 A further alternative for rock tunneling is a double shield TBM. Best suited for tunneling long distances, double shields combine the principles of both gripper and single shield TBMs. Double shields excel under stable geological conditions. Finally, there are classic tunneling shields that function best in ground replete with various geologies. Known as the most challenging terrain in which to tunnel, classic shields are flexibly designed to be adapted to changing ground, and require only a brief conversion time. They also are lower in cost than double shields and grippers.